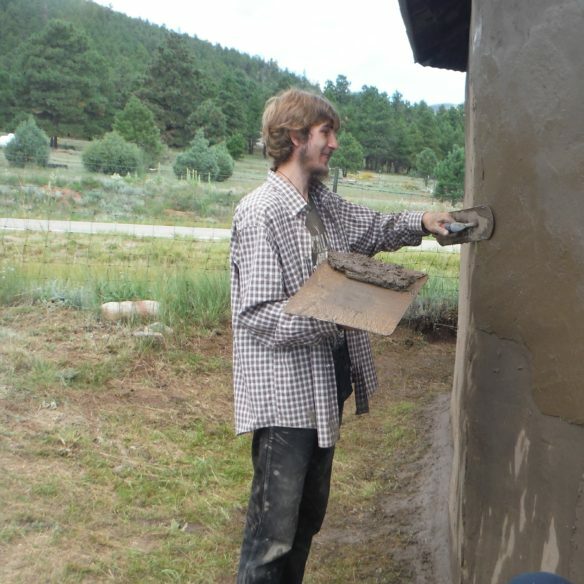 In 2017, with support from the McCune Foundation, Cornerstones Community Partnerships engaged youth in Mora County to learn about preserving their heritage through “hands on” adobe work repairing mission churches. The plan for the season included an agenda for youth to initiate a web site presence showcasing their skills and provide the community with cyber space access to young adobe workers. It soon became clear that this portion of our agenda would involve more time and planning than funding would allow during that summer. This spotlight page is now the first step and hopefully the catalyst for creation of their own website. Advanced fibre optic cables have been installed throughout Mora and will eventually offer substantial opportunities for their own website with contact information for cottage industries such as adobe repair work. In our continuing work with Mora youth we will be planning and accomplishing incremental steps toward a goal of realizing a sustainable independent adobe preservation cooperative in Mora County. Robbie Kelly, who grew up in Mora Valley, has interned with Cornerstones for seven summers. His first experience was at San Raphael Church in La Cueva, NM as a paid intern. He found he liked working with adobe and began to understand and appreciate that while he was contributing to maintenance of the church, he was also helping to sustain the historic nature and culture of the community. ‘It’s important to do things the community is doing. It’s mostly a Spanish community and there’s not too many things I can do. I don’t ride horses. I don’t go hunting. It brings up the community and I had a part in it,” Robbie said. As he became familiar with the many phases of adobe work, his passion for it and preservation skills grew. He has learned to mud and lime plaster, rebuild foundations, make quality adobe bricks, stitch walls, do woodworking, repair and replace roofing, and repair flooring, and has shown a strong potential for leadership. In 2017 he oversaw the first part of a wall reconstruction which included teaching adults and youth how to stitch a wall to key the new wall into the existing wall. He is most comfortable working with adobe construction, but also has had experience with frame construction. “I wish I could do adobe work all the time,” he says. Call or text him at 505.652.0741. We had an additional three youth interns from Mora. They learned how to mud plaster, to safely put up and take down scaffolding, and to do basal repairs. One very special aspect of the 2017 season was training that the youth received in conducting conditions assessments of the churches. This is a very important yearly procedure and a part of the dream to develop a group in Mora trained to accomplish assessments on their own. They have already expressed interest in joining us again this summer. With these youth and new recruits for the 2018 season, we will be building a small piece of the dream.